Oct 13, 2004 — Rabbi Nosson Slifkin – also known as the “Zoo Rabbi” – came to the Beren Campus Oct. 13 to give two talks about the animals, Torah, and evolution. 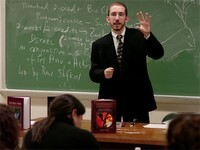 Rabbi Slifkin is an author and teacher at Midreshet Moriah, Peninim seminary, and Yeshivat Lev HaTorah. He also leads “Torah tours” at Jerusalem’s Biblical Zoo. His afternoon discussion, “Zoo Torah: Jewish Perspectives on the Animal Kingdom,” discussed several aspects of the relationship between Judaism and nature, including the process of identifying animals of the Torah and their symbolism and the Jewish perspective on human interaction with the animal kingdom.